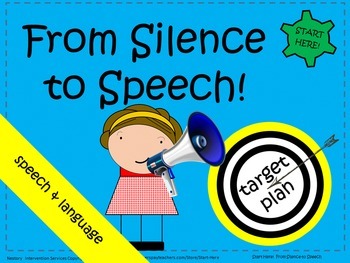 From Silence to Speech - speech development guidance with suggested activities. *This item is part of a BUNDLE. Do you have a child in your caseload that is non-verbal or speech delayed? Do you know what to target in session? Should you model language though play? Match pictures? Ask questions? Start Here! 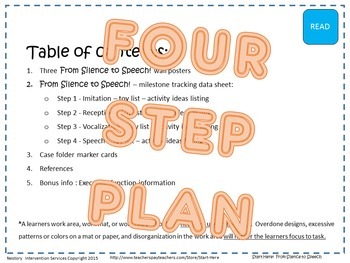 From Silence to Speech walks you through the four major milestones in communication development. It's best practice summed up into four easy to understand steps. 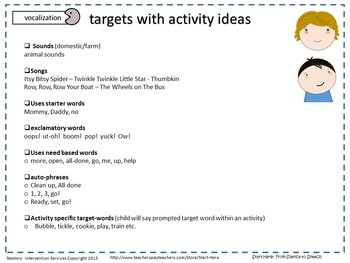 Use as a quick assessment, target for session guide, and for activity ideas. The key to communication development is to set up the developmentally appropriate situations in order to capitalize on the learners motivation - this resource will guide you through the process and make the most out of your time. Young children need to explore, but they also need to learn about boundaries and how to follow directions. A balance of free play and structured play is critical in developing the kinds of skills that will make them more flexible, resilient, and persistent. Daily engagement in these critical areas work together to create a “whole child”. Have Fun! “Start Here!” was created in order to provide access to high quality researched based activities for parents, preschool teachers, and daycare providers. The first years are a peak period for a toddler/preschooler and it is important to support the six domains of early childhood development. 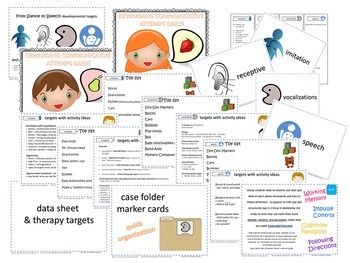 I created and used these materials in my own career as early intervention practitioner. My aim is that all adults who care and work with children will be empowered by the information and activities. Everyone, when using best practice, can help kids reach their potential.